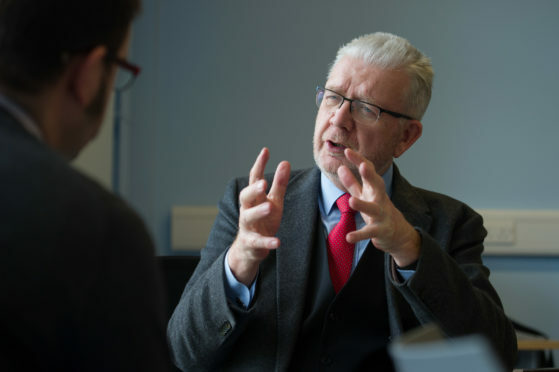 Mike Russell has been accused of “game playing” after demanding a second Brexit referendum and then saying the Scottish Government would not necessarily accept the result. The constitutional relations secretary, appearing before MSPs yesterday, suggested the “best outcome” to the Brexit deadlock would be a People’s Vote. However, moments after the comment, he said that the SNP government could well reject the outcome if the UK-wide result differed from the one in Scotland. Tory MSP Murdo Fraser then asked if the Scottish Government would accept the result of such a referendum. Mr Russell replied: “I think it would depend on what the vote in Scotland is, I think a situation in which the people of Scotland continue to support being members of the EU and were denied that option for a second time would be insupportable. Mr Russell later spoke about the steps the Scottish Government was taking to minimise the impact if the UK is forced to leave the EU without a deal in place. Mr Russell told MSPs on Holyrood’s Constitution Committee: “I want to stress very strongly at the outset we can not do everything. Retailers are “reasonably confident” they could keep their stores stocked if there was a no-deal Brexit, Mr Russell said, though he added supplies of some items might not be “completely uninterrupted”.